May is hoping that this election is the moment that she — and the Green Party faithful — have long been waiting for: many more elected Green MPs in the House of Commons. And with no clear front-runner, she's expecting a minority Parliament after the Oct. 19 vote, a situation that could make May something of a kingmaker. But before Canadians turn out to vote, they have some questions about this American-born climate campaigner. Google Canada has revealed the five most searched questions about each of the main party leaders, based on data from the six months leading up to the election call. Today, CBC News delivers answers to the most searched questions about May. We started earlier in the campaign with NDP Leader Tom Mulcair and Conservative Leader Stephen Harper, and last week we looked at Liberal Leader Justin Trudeau. Here's what Canadians wanted to know about the Green leader, and some answers to their questions. 1. Who is Elizabeth May? She's a real Harry Potter aficionado and master butter beer brewer. But we're going to go out on a limb here and say she's better known for her other job: leader of the Green Party of Canada, a party she's led since 2006. She has managed to do what few Green Party leaders in the Western world have accomplished: get elected in a first-past-the-post electoral system. It took her three tries, including two strong second-place finishes, but in 2011 she defied the odds by unseating cabinet minister and longtime MP Gary Lunn. She won the riding of Saanich-Gulf Islands, on Vancouver Island, with nearly 50 per cent of the vote. She has brought the party from low single-digit support to a high point of nearly a million votes in the 2008 federal election. That vote slumped significantly in the last election, something she blames on her exclusion from the last leaders' debate. Since her election, May has been routinely named one of the hardest-working MPs on Parliament Hill, and parliamentarian of the year. She's sponsored a number of private member's bills including the Lyme Disease Act, a bill that passed the House with a unanimous vote. Before entering the fray of elected politics, May worked as a lawyer, a policy adviser to Brian Mulroney's minister of the environment and as executive director of the Sierra Club of Canada, one of the country's largest environmental advocacy groups. Her activism on the climate front is something that runs in the family. Her mother was an anti-nuclear campaigner — she was routinely branded a Communist for her activism in an era of the red scare — and a strident opponent of pesticides. May says she was drawn to the environmental cause at a young age. In her recent biography, Who We Are, May recounts reading about pesticide poisoning of sheep in Arizona. She has parlayed that early passion into an impressive track record: stopping pesticide spraying on Cape Breton's forests and preventing uranium mining in Nova Scotia; a move to end clear-cut logging on Lyell Island; and she also had her hand in the creation of the Gwaii Haanas National Park Reserve, among other accomplishments. Now, of course, she's active in anti-pipeline politics. 2. What did Elizabeth May say? It's hard to decipher what exactly Canadian were searching for when they asked this question. But based on the timeline for this search data, it seems people were asking about her edgy remarks at the Parliamentary Press Gallery dinner in May, when her off-colour remarks caused a stir online. It is a time-honoured tradition for federal party leaders to address the press gallery — and their guests — at the annual dinner. These speeches are usually humorous, a chance for the leaders to poke fun at themselves and the journalists that cover them. This year's fête — held shortly after Omar Khadr was freed on bail pending an appeal of his U.S. conviction on terrorism charges — was peppered with references to the government's handling of his case. But May did not hold back, taking it to the next level. "Omar Khadr, you've got more class than the whole f--king cabinet," May said, referring to the Conservative government, as Tory MP and Transport Minister Lisa Raitt tried to usher her off the stage. Raitt intervened multiple times and attempted to persuade May to end her speech, but instead, May played a recording of Welcome Back, Kotter, the theme song from the 1970s sitcom. May blamed fatigue and jet-lag for the eyebrow-raising speech. But many stepped forward to defend May, including CBC Radio's Michael Enright. In one of his on-air essays he took aim at the news media for blowing it out of proportion. "Why the mountain of coverage, nearly all of it unsympathetic? Was it because she was appearing before a roomful of journalists? Would the story have disappeared if she had been speaking to environmentalists? Was it because she sometimes has seemed to be holier than thou? Was it because she is a woman? Whatever the reason, May was mugged by the media." 3. Where does Elizabeth May live? After years of moving around the country for work — she has lived for most of her professional life in Nova Scotia and Ottawa — May has now settled in Sidney-by-the-Sea, B.C., near Victoria. May is an American by birth. She grew up in Connecticut. But after a summer vacation in Canada, her father, an accountant, and her mother, an artist and sculptor (and an activist as mentioned) uprooted the family in 1973 and moved to Cape Breton Island. It was an atypical move to say the least, leaving the relative comfort of New England to become restaurateurs in the tiny town of Margaree Harbour, on the edge of the Cabot Trail. It was also a move that nearly bankrupted the family. May describes this move as a "demarcation," and a tough time in her life when she learned the struggles of living in relative poverty, working as a waitress in her family restaurant. She missed out on an undergraduate education because her parents couldn't afford to pay (she later attended law school at Dalhousie). But she writes that she quickly absorbed Canada's history, rewiring her brain to "a Loyalist tradition." 4. Is Elizabeth May in divinity school? May is not in divinity school, but she is a practising Anglican. After leaving the Sierra Club, she began studying to become a priest. She took theology classes at St. Paul's University in Ottawa — and thought about settling down as a parish priest. She wanted to learn Hebrew and Greek and read original texts of the Bible. But her studies were put on hold when she returned to politics. Her Christian faith is still strong, however, and she's an unabashed follower of Jesus Christ. "In the U.S., if you're a not out-of-the-closet practising Christian, you almost have no chance of being elected," May told the Anglican Journal in an interview. "It's the opposite in Canada. I get flak for being a Christian. "It's the source of my strength in dealing with somewhat insurmountable odds — this profound belief that the impossible is possible." 5. 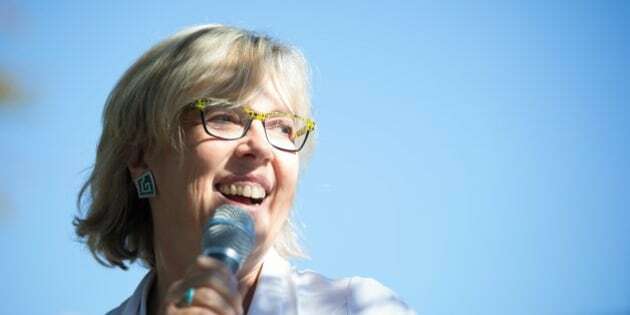 How old is Elizabeth May? May is 61 years old and doesn't have any plans to slow down. While she has said she doesn't expect to be the Green Party leader forever — or even beyond the end of the next Parliament — she hopes to stay on as a parliamentarian for the foreseeable future. May doesn't expect to be prime minister after the election — she says it would make "one hell of a TV movie," if she did — but she hopes to add to her party's seat count. She says that by getting more Green MPs elected, she'll be able to expand the party beyond, what some people perceive as "the party of one."